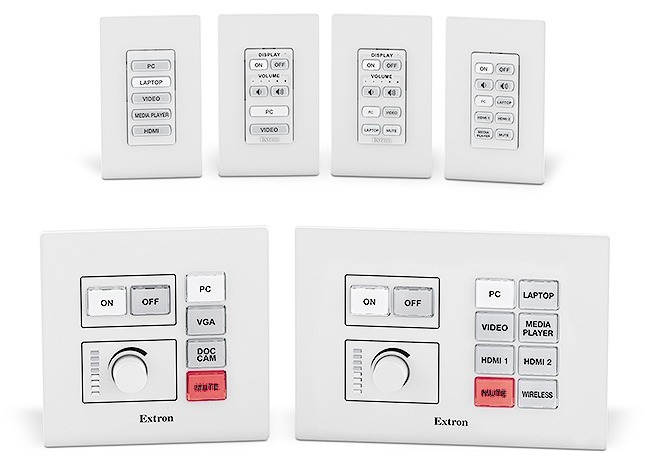 Extron has just launched the NBP Series network button panels, a new product family that brings easy-to-deploy control to a broad variety of AV applications. Network button panels connect to a control processor using standard Ethernet. 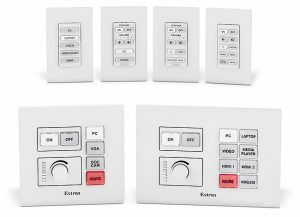 These customisable, control panels work in conjunction with an IP Link Pro control processor, HC 403 or HC 404 to perform a wide variety of AV system functions such as display on/off, input switching, volume control and much more. The buttons can be easily customised using Extron Button Label Generator software or by using the online Custom Button Builder application. Network button panels also offer PoE which allows them to receive power and communication over a single Ethernet cable. “Our new network button panels are another way we are bringing easy-to-use, and easy-to-deploy AV control solutions to our customers,” says Extron vice president of worldwide sales and marketing Casey Hall. The NBP 100 and NBP 200 are two and three-gang network button panels with field-labelable, dual-coloured backlit buttons and a control knob with LED indicators for controlling various functions on virtually any device. The NBP 105 D, NBP 106 D, NBP 108 D, and NBP 110 D are decorator-style in single gang form factors. Decorator-style button panel models ship with black and white wallplates and mud rings for easy installation.